I spent most of today feeling vaguely queasy and doing my best to keep a headache at bay by throwing ibuprofin at it every few hours. I did go for a couple short walks, thinking maybe if I got up and moved around things might improve, but of course they didn’t. The weather was rather nice outside though – warm for this time of year, and sunny, and it wasn’t until this evening that it finally dawned on me that the issue was, as usual, my sinuses. Any time the barometer decides to do a big change, my sinuses respond by throwing a massive tantrum. So much fun Ah well. 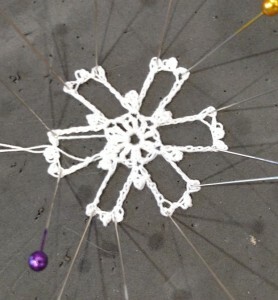 Yesterday’s snowflake turned out much better than the day before’s, primarily because I did it at home, all by myself. I rather like this one because of the non-pointy ‘points’. It feels as if, were I to remove the pins, it would just roll merrily away. The roll would be a bit wobbly, of course, because I am still working on keeping a consistent gauge, but it would be fun to watch. Well, until it was trampled by a cat, because that is the way of things in this house. 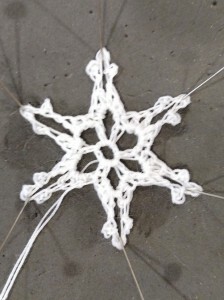 Today’s snowflake looks a lot like a couple of the previous snowflakes I’ve already made (except slightly neater, because I really *am* getting better at this. Slowly. Very, very slowly). But I swear it is a different snowflake. It is #12 in the book. So I shall trust the designer to not have snuck in a duplicate when the editor wasn’t looking.